Archie and Tristan are best friends. Archie has a beautiful beard, the knees of a 55-year-old (despite being in his early thirties), and uses the pronouns he/him. Tristan has been drawing comics for over a decade, will always eat an entire bag of Doritos in one setting, and uses the pronouns they/them. 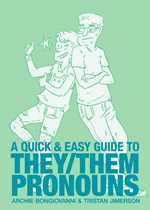 With A Quick & Easy Guide to They/Them Pronouns, Archie and Tristan deliver an easy to read guide to what can be a confusing or sensitive topic for many people. It is funny, touching at parts, but most importantly, it explains how to go about using gender-neutral pronouns in a way that is easily understood. They go over how to ask what pronouns a person uses as well as what to say if you accidentally refer to someone by the wrong pronoun. (Spoiler alert: the answer to both of these situations is as easy as asking respectfully or apologizing sincerely). It may be difficult at first, but with all things, practice is key. Soon it won’t seem so awkward and you’ll have the added benefit of being more respectful to your fellow human beings!